Racing can be challenging, rewarding, heartbreaking, and intensely satisfying—all in the same weekend! It has a way of separating the best from the rest in a way everyone can see. It’ll make you dig deep and bring your best game to the gate—because you can be sure the other guy is doing just that. And racing is no different for a company, either. Our engineers have to work hard to bring you the best bikes in the class, and it’s all on the line when that start gate drops. 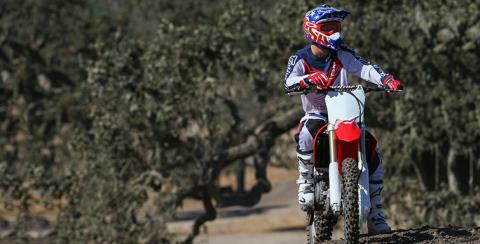 And that’s exactly why you should be on a Honda CRF250R. The CRF250R is a finely-honed racing machine, but since it’s a Honda it’s also one of the most rider-friendly bikes you can find. 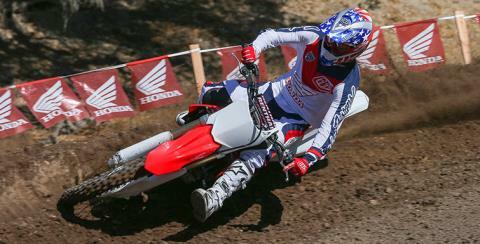 Just look at how many privateers roll up to the track with a Honda in the back of their truck. Our 2017 model features a powerful, compact Unicam® engine with a high-lift cam and titanium intake and exhaust valves. The unique twin-muffler exhaust keeps the bike’s weight and center of mass symmetrical, so the handling is unmatched. A Showa® air fork makes the CRF250R easy to fine-tune at the track, and the fully adjustable Showa rear suspension likewise lets you dial the bike in fast. Wanna win? This is the bike you want to ride. The 2017 Honda CRF250R—the machine that can make it happen for you. DUNLOP MX52FA TIRES: Developed using Dunlop’s “block-on-block” technology, the unidirectional MX52FA front tire and MX52 rear tire give excellent feedback and are a perfect complement for the CRF250R’s suspension. 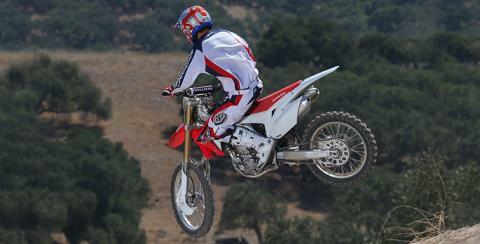 REAR WAVE DISC: The wave-rotor shape of the CRF250R’s rear disc looks sharp, shaves weight and collects less debris. 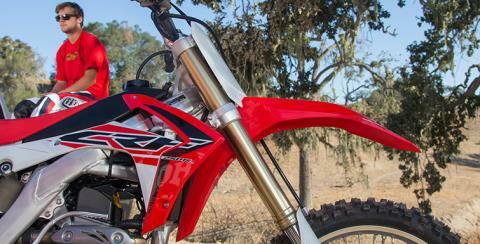 SHORT TWIN-MUFFLER EXHAUST SYSTEM - Like our CRF450R, the CRF250R uses an exclusive twin-muffler setup. 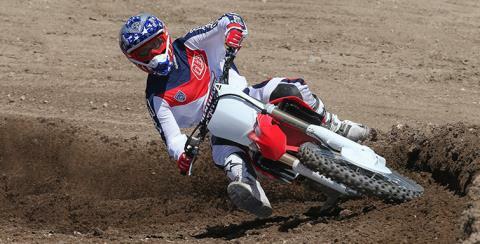 The mufflers are way shorter and lower, tucking in much closer to the bike’s center of mass. That helps make the CRF250R a better handling machine, and also contributes to the bike’s power delivery. 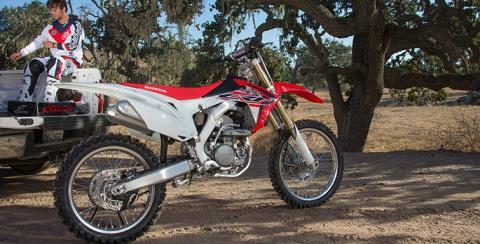 LIGHTWEIGHT REAR SUBFRAME: The CRF250R’s twin-muffler setup lets our engineers move the mufflers towards the bike’s center of mass. That also lets us move their mounting points so the subframe can be lighter—and that means improved handling characteristics. 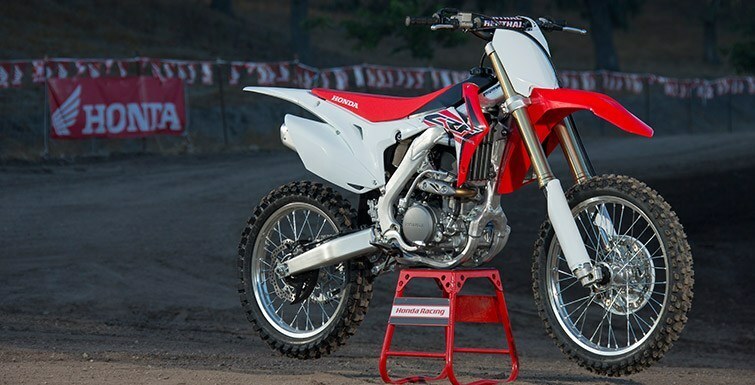 NEXT-GENERATION ALUMINUM FRAME: The CRF250R’s twin-spar aluminum chassis features lower frame spars to help lower the center of gravity and improve center of mass. The result? A machine that’s both responsive and stable, and that’s easier than ever to rail around the next berm. 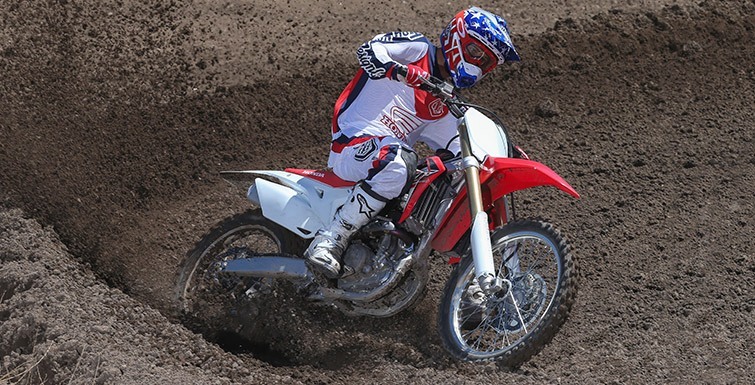 PGM-FI SETTINGS: The settings on the CRF250R’s Programmed Fuel Injection are dialed in to help deliver smooth, predictable engine performance. 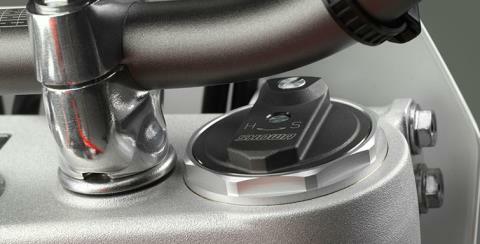 But you can try your hand at tuning, too, with our available HRC Fuel Injection Setting Tool. It’s easily adjustable to specific track conditions, and you can refine your own settings in place of the smooth and aggressive settings on the engine mode selector. 249cc UNUICAM ENGINE: No other engine is a compact as Honda’s Unicam® design, offering the best of SOHC and DOHC engineering. 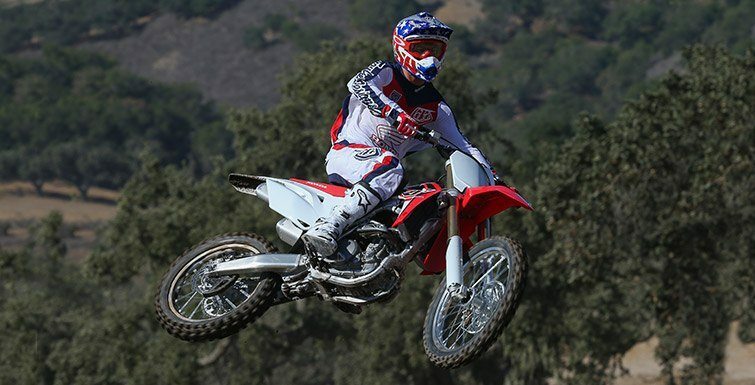 Proven in the open class and especially on the CRF250R, it also delivers the kind of predictable power you need. BLACKED-OUT ACCENTS: Blackened radiator fin guards, rear disc guard and brake line guides look sharp and help the CRF250R stand out from the competition. ENGINE MODE SELECT BUTTON: A simple handlebar-mounted mode-select button lets you dial in engine power delivery character with a push of your thumb. Choose between Standard, Smooth and Aggressive, depending on track conditions. If you want to change up the settings, you can reprogram the Smooth and Aggressive modes with our optional HRC Tuning Tool for a custom-tailored power delivery. 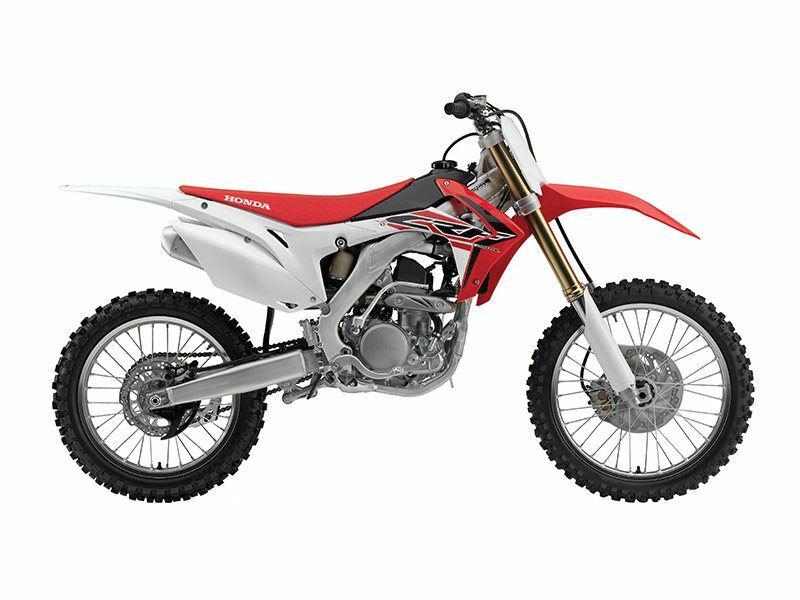 SHOWA® SFF-TAC: The CRF250R’s 49mm inverted Showa® SFF-TAC (Separate Functioning Fork) air fork weighs less than a conventional-spring design, it’s easier to adjust, and it helps keep the front end planted and enhance the bike’s stability. 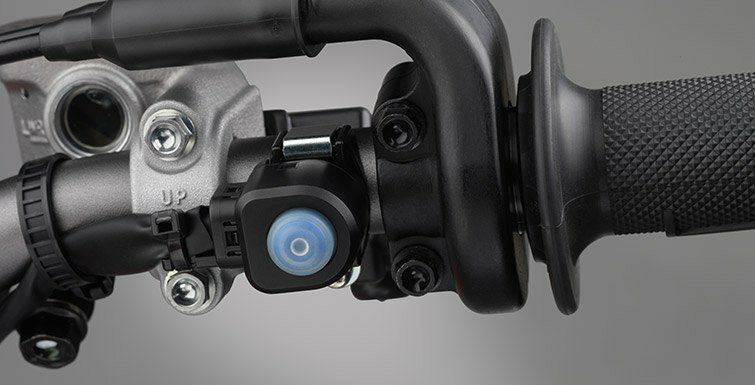 HONDA PROGRESSIVE STEERING DAMPER: (HPSD): The HPSD is designed to work in conjunction with the front and rear suspension to give you unmatched steering precision under braking, acceleration, and in the whoops, ruts, and hardpack. There's nothing like it! 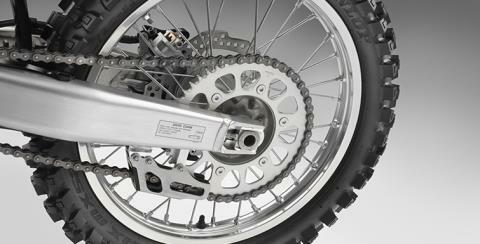 LARGE FRONT BRAKE ROTOR: A full 260mm in diameter offers excellent stopping power and also superior lever feel.